Paramount Home Media Distribution continues to expand its late summer array of home entertainment product offerings with a surge of new listings destined for retail during the first two weeks of September. With August booked wall-to-wall with such fan favorites as Californication: The Seventh Season (Aug. 5), The Good Wife: The Fifth Season (Aug. 19), NCIS: Naval Criminal Investigation Service - Season Eleven (also on Aug. 19) and both Criminal Minds: The Complete Ninth Season and Elementary: The Second Season (both streeting on Aug. 26), the studio had to start moving into the post-Labor Day period for the wave of TV-on-DVD releases. The festivities kick off on Sept. 2 with Bonanza: The Official Seventh Season, Volume One (a four-disc set) and Bonanza: The Official Seventh Season, Volume Two (this one is a five-disc collection). 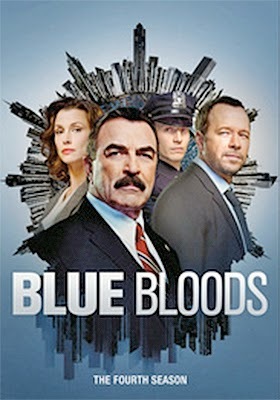 On Sept. 9 Tom Selleck and Donnie Wahlberg return as the New York City police family, the Reagans, in Blue Bloods: The Fourth Season (six discs). On the same date, Sept. 9, the Carringtons bid farewell to their fans with Dynasty: The Final Season, Volume One and Dynasty: The Final Season, Volume Two (both SKUs are three-disc sets). 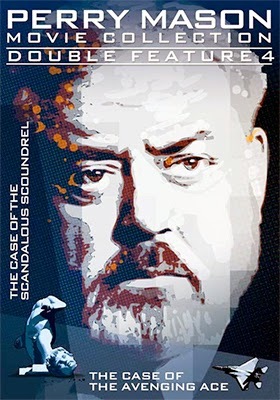 Three more volumes (double-features each) of Raymond Burr’s Perry Mason television series feature-length cases are also slated for delivery to retail on Sept. 9. Included here are Perry Mason Movie Collection Double Feature #4, which teams The Case of the Scandalous Scoundrel with The Case of the Avenging Ace; Perry Mason Movie Collection Double Feature #5 — double-billed are The Case of the Lady In The Lake and The Case of the Lethal Lesson — and finally, Perry Mason Movie Collection Double Feature #6, which finds The Case of the Musical Murder paired with The Case of the All-Star Assassin. Not done yet! On the kidvid front the next DVD edition from the Let’s Learn series, Let’s Learn: Patterns and Shapes is also on the release calendar for delivery on Sept. 9. 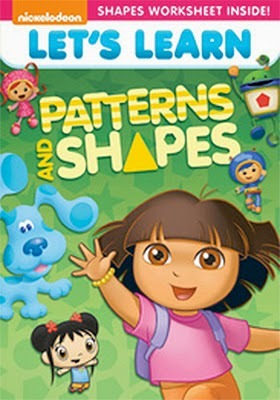 Dora, Boots, Team Umizoomi and more animated friends from Nickelodeon’s popular children’s franchises are on hand to present learning lessons related to patterns and shapes (other DVD releases in the series include: Let’s Learn: 1,2,3s, Let’s Learn: A,B,Cs and Let’s Learn: Colors). A double-disc collection of SpongeBob SquarePants: Halloween - 5 Spooky Sea Tales (with bonus adventures) is also on the Sept. 9 release calendar, as is the Farrelly Brother’s 1996 comedy, Kingpin, starring Woody Harrelson and Randy Quaid — DVD and Blu-ray SKUs will be available. 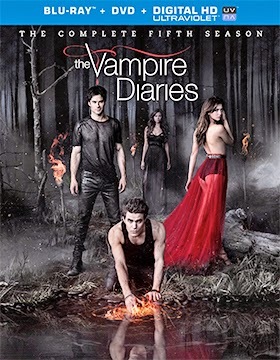 While the theatrical hits of the summer go about their merry way with post-Labor Day dates yet to be announced, Warner Home Video wasted no time this past week filling in its release calendar with TV series programming and other golden nuggets for delivery during September. Celebrating the career of Audrey Hepburn there will be a three-film Blu-ray collection of her work — attractively priced at just $29.98 for all three films — available on Sept. 30. 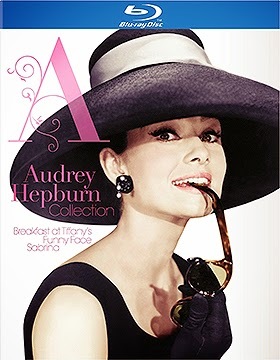 Titled simply the Audrey Hepburn Collection, fans can enjoy Breakfast at Tiffany’s, Funny Face and Sabrina. All three film selections have previously been released as individual SKUs. Two venerable TV series will be getting updated on Sept. 9 with the latest seasons being made available for fans to enjoy as either DVD or Blu-ray (with UltraViolet) product offerings. Also shipping to retail on Sept. 9 are Blu-ray (a four-disc collection) and DVD (six discs) SKUs of Supernatural: The Complete Ninth Season. Bonus features include selected episode commentaries, a behind-the-scenes “Mockumentary,” a gag reel, deleted scenes, a dozen featurettes and the 2013 Comic-Con Panel discussion. Expect another wave of non-theatrical release announcements in the next couple of weeks as the studio fills in its dance card on the run-up to ‘Q4 summer theatrical blockbusters street date announcements. 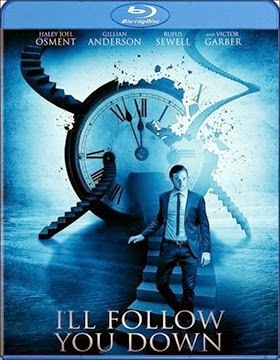 Writer/director Richie Mehta’s time-jumping tale, I’ll Follow You Down, will be getting a DVD and Blu-ray push from Well Go U.S.A. on Aug. 5. This follows a selected-city theatrical launch in early June. Gabriel Whyte (Rufus Sewell) is a researcher working on wormholes or time travel — or some such thing — who kisses his wife Marika (the X-Files Gillian Anderson) and young son goodbye one morning and heads off to Princeton for a three-day gathering of brainiacs … and promptly disappears. That was back in 2000. A dozen years have passed and his son, Erol (Haley Joel Osment), is now following in his father’s footsteps. One day he is approached by his grandfather (played by Victor Garber) with an interesting proposition … your father, my son, is not dead, instead he solved the riddle of time travel and has gone back in time. That may sound farfetched, but he’s found his son’s detailed notes and needs his grandson to see if the theoretical work is actually possible. He’s absolutely convinced that his son made the jump along a very specific timeline to meet one individual (and very famous at that) at a key point in time. Challenged by the love of his life, Grace (Susanna Fournier), Erol must face her concerns, “Stop working on this … everyday I’m afraid that this will all disappear because you will succeed.” It is a conundrum that will tax his very sanity. Writer/director Cory Krueckeberg’s film within a film, Getting Go, The Go Doc Project, will be heading to DVD courtesy of Wolfe on Aug. 5. Even for those not into gay cinema, Krueckeberg’s concept here is well worth a look on its merits solely for its structure. Consider this, Tanner Cohen is an actor, a real honest to goodness actor … the star of Krueckeberg’s award-winning Were the World Mine (released on DVD by Wolfe back in 2009) and the “Doc” of our story. They have a history; a rapport. Matthew Camp is a real-life go-go dancer who has a following (and since making this film has branched out into other ventures). He works the club scene in New York as a dancer … he could easily be mistaken for a fashion model … lean, muscular and intelligent. He is the “Go” of our story. Now whether “Go” is in on the concept or not (he could easily google the people he is meeting in the film and see that they are actors, filmmakers, etc.) doesn’t really matter. It still plays, which is pretty much like this … “Doc” is hot for “Go” and to get close to him he sets up a storyline about making a documentary on the New York club scene with dancers — specifically Matthew Camp — as the focal point. His crew consists of himself and Krueckeberg (among others) filming their conversations (interviews) and interactions (which are progressive in nature). In the end it does not matter if Cohen is in on the concept. The film works as a study in relationships at one level and conceptual filmmaking on another level. Bonus features for this award-winning festival entry (Toronto Inside Out Lesbian and Gay Film and Video Festival, Seattle Lesbian & Gay Film Festival, Rhode Island International Film Festival … and more) include a filmmaker Q&A session. writer/director Kit Williamson’s nine-episode web series Eastsiders, which has been transformed into a feature-length film for this home entertainment release. 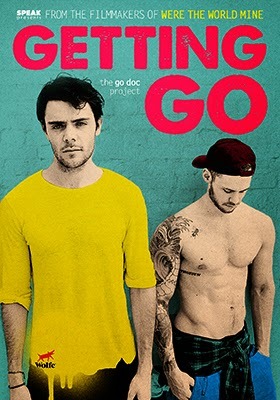 When the wheels begin to come off Cal (Kit Williamson) and Thom’s (Van Hansis) relationship in Los Angeles’ picturesque Silverlake area drama abounds. Drugs, sleeping around and love-love-hate relationship are all rip for the narrative. Cal’s best friend, Kathy (Constance Wu) also gets in on the action with romantic issues of her own … you almost have to feel for her boyfriend, Ian (John Halbach) because she’s not exactly firing on all cylinders. Bonus features include a blooper reel and a behind-the-scenes featurette. Mill Creek Entertainment will have genre fans’ hearts all a flutter on Aug. 19 with the Blu-ray release of the Ray Harryhausen Creature Double-Feature. 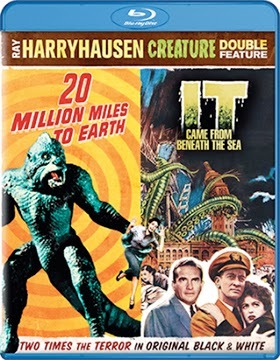 For just $14.98 (before discounts at retail), you get hi-def versions of director Robert Gordon’s 1955 sci-fi thriller, It Came from Beneath the Sea and director Nathan Juran’s 1957 alien creature feature, 20 Million Miles to Earth. It Came from Beneath the Sea teams Kenneth Tobey (The Thing from Another World, The Beast from 20,000 Fathoms, Billy Jack, etc.) with Faith Domergue (who starred the same year in This Island Earth) and features Ray Harryhausen’s atomic age octopus and its attacks on San Francisco’s Golden Gate Bridge and the iconic Ferry Building on the Embarcadero. The Ymir, an ever-growing creature from Venus, is center stage in 20 Million Miles to Earth, which starred William Hopper (perhaps best known as Paul Drake in the Perry Mason television series, plus such films as Rebel Without a Cause, The Deadly Mantis and The Bad Seed) and Joan Taylor (she starred in Earth vs. the Flying Saucers the previous year). The big set piece here is the climatic battle at the Colosseum in Rome! There have been a number of documentaries related to the events of 9/11 … some good, some bad … even the bad ones tend to be chilling. 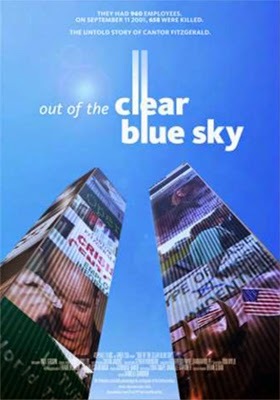 On Sept. 2 (clearly timed for this year’s anniversary of the event), Virgil Films & Entertainment will deliver to DVD documentary filmmaker’s Danielle Gardner’s Out of the Clear Blue Sky, a one-of-a-kind story about the events of that day (and the aftermath) that is like none other. The bond and equity trading firm of Cantor Fitzgerald (founded just after World War II) occupied floors 101 through 105 of One World Trade Center. 658 employees were just beginning their workday when American Airlines Flight 11 plowed into the floors just below them. Trapped, they all died … the company was devastated in a heartbeat. Gardner’s film not only looks at the events of that morning through the eyes of Howard Lutnick, the C.E.O. of the company — who only escaped the fate of his employees by taking his young son to his first day of school — but also details the survival and eventual resurrection of the company. 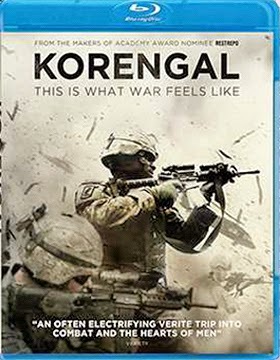 In other release news this week from Virgil Films & Entertainment, Sept. 9 will be the DVD and Blu-ray debut date for documentary filmmaker Sebastian Junger’s Korengal, a follow-up (or expansion of) to his award-winning Restrepo. The ARR is 102 days and a brief showcase run has generated ticket sales of $14,630. Using footage filmed by photojournalist Tim Hetherington during 2007 and 2008 (Hetherington was killed while on assignment in Libya in 2011), Junger shifts the focus of Restrepo from the battles and life on the line to the experiences and thought of the frontline soldiers in this remote area of Afghanistan. 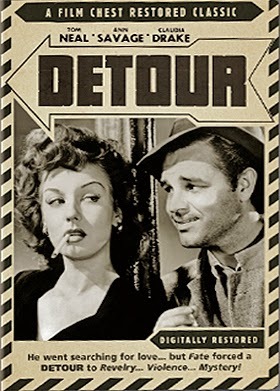 The latest film restoration project from the Film Chest was announced this past week and it is none other than director Edgar G. Ulmer’s perfectly-pitched 1945 film noir masterpiece, Detour. It will be available for collectors to savor on July 22. Although a “poverty row” production, Detour magically rose above its humble roots over the years to be revered as one of the great film noirs … with Ann Savage gaining cult status as the predatory Vera. Tom Neal, well, his star burned brightly during this period until the famous altercation with Franchot Tone over their mutual love affairs with actress Barbara Payton. Universal Studios Home Entertainment will be bring DVD and Blu-ray/DVD Combo Pack editions of director Michael Tiddes’ demonic possession comedy starring Marlon Waynes, A Haunted House 2, to market on Aug. 12. The ARR comes in at 116 days and domestic ticket sales were a lackluster $17.3 million. Bonus features included deleted and extended scenes as well as commentary from director Michael Tiddes (also A Haunted House last year) and writer/producer and star of the film, Marlon Wayans … they are joined by co-writer Rick Alvarez (who also co-scripted A Haunted House). Anchor Bay Entertainment and Shout! Factory are teaming for two Blu-ray collections showcasing the Halloween film franchise. Streeting on Sept. 23 are 15-disc “Deluxe Edition” and 10-disc presentations of Halloween: The Complete Collection. 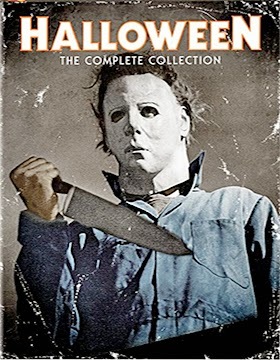 Both SKUs feature all ten films in the series … the “Deluxe Edition” has five additional discs showcasing a never-before-released producer's cut of Halloween: The Curse of Michael Myers; the network TV presentation of the original Halloween; the network TV presentation of Halloween II and unrated versions of both Rob Zombie's Halloween and Rob Zombie's Halloween II.